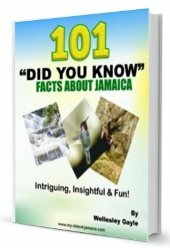 Merlene Ottey was born to Hubert and Joan Ottey in Cold Spring, Hanover, Jamaica. In her early school years in the 1970s, Ottey attended Gurneys Mount and Pondside Schools before graduating from Ruseas and Vere Technical high schools. Ottey's inspiration came from listening to the track and field broadcast from the 1976 Summer Olympics in Montreal, where Donald Quarrie ran in the sprint finals. Her athletics career took off when she moved to the U.S. and attended the University of Nebraska in 1979, where she joined the track team. She represented Jamaica in the 1979 Pan American Games, winning a bronze medal in the 200 m.
In the 1980 Moscow games, Ottey became the first female English-speaking Caribbean athlete to win an Olympic medal. Back in Jamaica, she was awarded an Officer of the Order of Nation, and the Order of Distinction for ‘services in the field of sport’. In the 1982 Commonwealth Games, Ottey won a gold medal in the 200 m and silver medal in the 100 m. Nearly a decade later, in the 1990 Commonwealth Games, she won gold in both events. 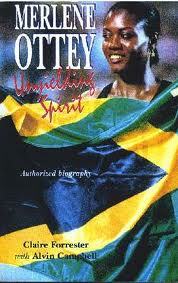 Ottey was named Ambassador of Jamaica after her gold medal win in the 1993 world championships. 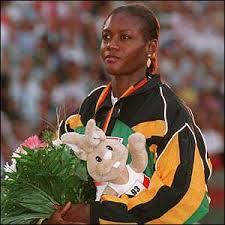 She has also been named Jamaican Sportswoman of the year 13 times between 1979 and 1995. Throughout her career, she has won nine Olympic medals, the most by any woman in track and field history. Her seven Olympic appearances from 1980 to 2004 are the most by any Track & Field athlete. The next highest is six, by javelin thrower and heptathlete Tessa Sanderson, discus thrower Lia Manoliu, and middle-distance runners Maria Mutola and João N'Tyamba. She won 14 World Championship medals between 1983 to 1997 —more than any other athlete, male or female — however, her failure to win many golds in major international competitions earned her the nickname "the Bronze Queen" in racing circles. She has won a total of three gold, three silver and eight bronze medals in the 4 x 100 m relay, the 100-m, and 200-m races. Ottey was appointed an Ambassador at Large by the Jamaican government in 1993. Click Here to read the full artile on Merlene Ottey on Wikipedia.